Jo-Han was a model company based in Detroit, MI years ago. I believe they went out of business in 2000. This kit hit the market in the 1970's. According the price label still on the box, I paid a whopping $1.50 for the kit back in the 70's. U.S. carrier based fighter in the second part of the war was thus filled by the Grumman F6F Hellcat, powered by the same Double Wasp engine. First flown on the Corsair's first prototype in 1940. The Corsair served to a lesser degree in the U.S. Navy. As well as the U.S. and British use the Corsair was also used by the Royal New Zealand Air Force, the French Navy Aeronavale and other, smaller, air forces until the 1960s. Some Japanese pilots regarded it as the most formidable American fighter of World War II, and the U.S. Navy counted an 11:1 kill ratio with the F4U Corsair. As already mentioned above, Jo-Han was once located in Detroit, MI and went out of business. I don't remember just what all kinds of kits they made as I only have this one aircraft kit in my stash by them. This kit came in a shrink-wrapped tray and lid type box. the parts inside are tight fitting to all 4 corners of the tray. Trees are loose and not cello bagged. One side panel has a one-paragraph history of the F4U-1 and a color illustration of the tail hook and main wheels that can be posed up or down. Other available kits listed here are: kit no. A-101 a Messerschmitt Bf-109F or G, kit no. A-102 a Republic P-47D Razorback or Bubbletop, kit no. A-104 a Messerschmitt Me-262A-1A, A-2A, B-1A or B-1A(U), kit no. A-105 a Zero "Zeke" or floatplane "Rufe", kit no. A-106 a Curtiss P-40B or C.
The other side panel has 3 more color illustrations: the drop tank, the 8 rockets, the 2 bombs and the display stand. The kit features an EXCLUSIVE FRAME PACK. Every part securely locked in a frame, with a picture of this. 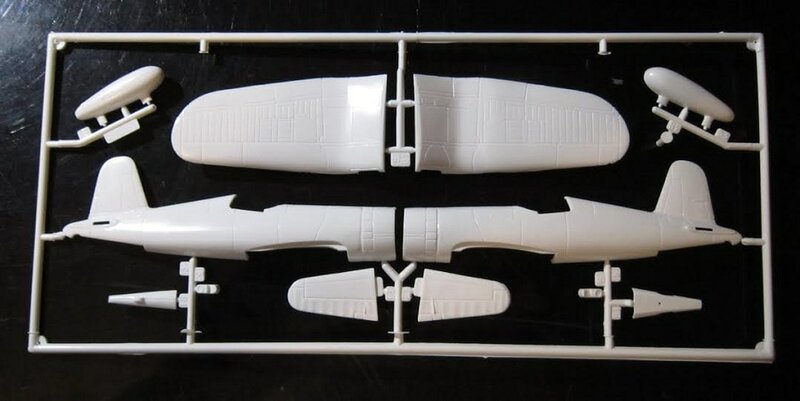 This kit contains 2 chalk-white trees of parts, a clear tree, the decal sheet and the instructions. The instructions consist of a single sheet printed on both sides in 8 1/2" 11" page format. 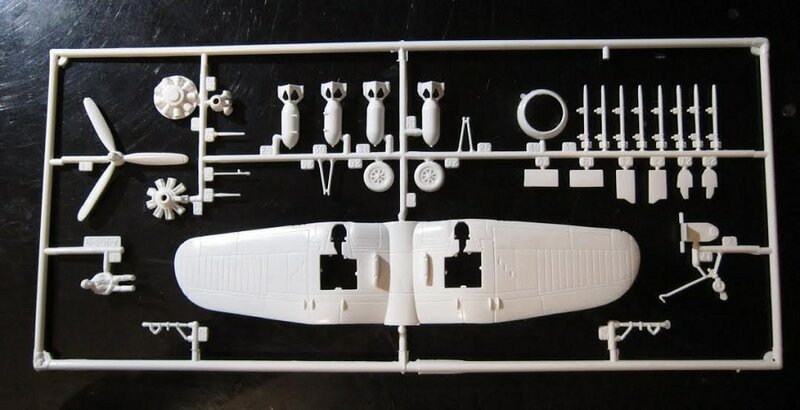 Its face side begins with READ THIS BEFORE YOU START instructions followed by and exploded drawing for assembly of the fuselage halves, pilot and his seat, elevators wings, pitot tube and air intakes, accompanied by text to walk you through the build. The other side of the sheet has a second exploded drawing for assembly of the propeller's engine cylinders, drop tank, landing gear, rockets and bombs and the tail hook. This drawing also has a lot of text with it. At the bottom of the page is two 3-views for color schemes. 1. A F4U-1 flown by Lt. Ira Kepford. It is matt sea-blue on the upper portion of the fuselage and the tops of the wings. The mid portion of the sides of the fuselage is intermediate blue and the undercarraige is insignia white.It has a black and white skull and crossbones pirate flag logo on the sides of the cowling, 16 victory markings over Japanese aircraft under the cockpit, followed by a white no. 29. 2. A F4U-1 flown by Major Gregory "Papy" Boyington. It is in the same color scheme as Kepford's Corsair. It has the name "Lulubelle" in yellow below the cockpit, before 20 victory markings over Japanese aircraft and a white no. 86 in front of the fuselage star with bars. The decals complete the kit. ​There are no parts trees illustrations in the instructions. However, there are number tabs next to the parts on the trees. Control surfaces are molded solid and will take surgery to re-position. Panel lines are of the raised variety. This is a nice older kit of a corsair version. 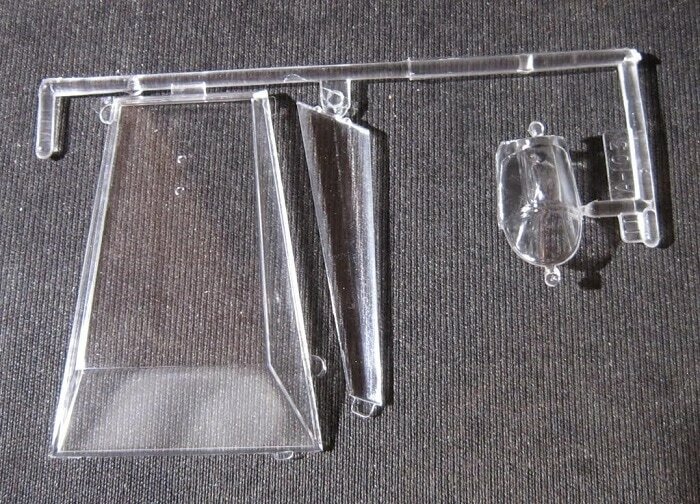 ​I purchased my kit back in the 70's at my local hobby shop and am willing to sell it for a reasonable offer.